When I hear this song, I think of church. It completely sounds more like something you would sing in church rather than in a more informal setting. 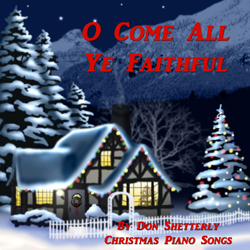 O Come All Ye Faithful is a beautiful and lovely song that I do not recall playing as much. It is more of a praise filled song about Jesus being born on Christmas day. While this is not the top Christmas song in my view, there was no way I could put together a CD without having it as part of the collection. Track #10 of 15 songs on Christmas Piano. The author of this Latin hymn also known as Adeste Fidelis is unknown. Sometimes it is attributed to John Wade. It became popular after Frederick Oakeley translated it into English in 1841. The author of the music is generally credited to be John Reading. The Christmas song, O Come All Ye Faithful is actually a modern day version based upon a hymn written back in the 18th century. The Latin text to this song as found in a manuscript at the College at Douai which started out in France and then was later exiled to England at the time of the French Revoluation. There are seven manuscripts containing the Latin text from this hymnand dated between 1743 to 1761. Each one of them appears to have been written and signed by John Wade. John Wade made his living by copying and selling plainschant and other music. It appears that in the version of the song I have, it has omitted another stanza. Here is stanza two that was omitted from the copy I have.